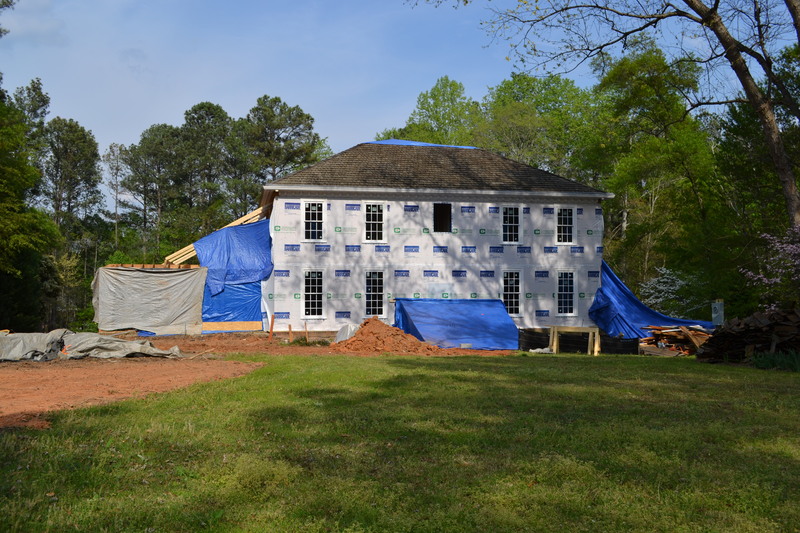 The windows are back in, front is wrapped and old landscaping has been removed. The changes in the backyard are dramatic. 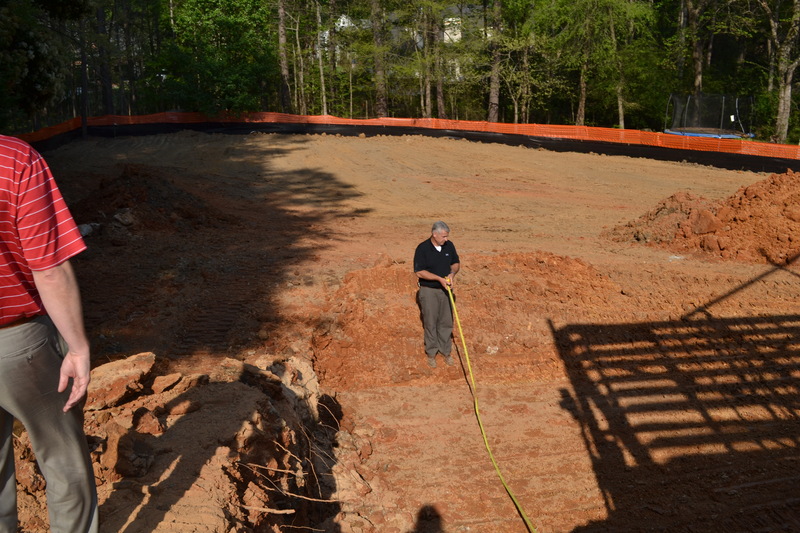 The footings are set to be poured today and then the addition can begin next week! Today, we received a basic landscaping layout plan. It is just an overview of how to put the puzzle pieces back together but it give us a birds-eye view of the property. 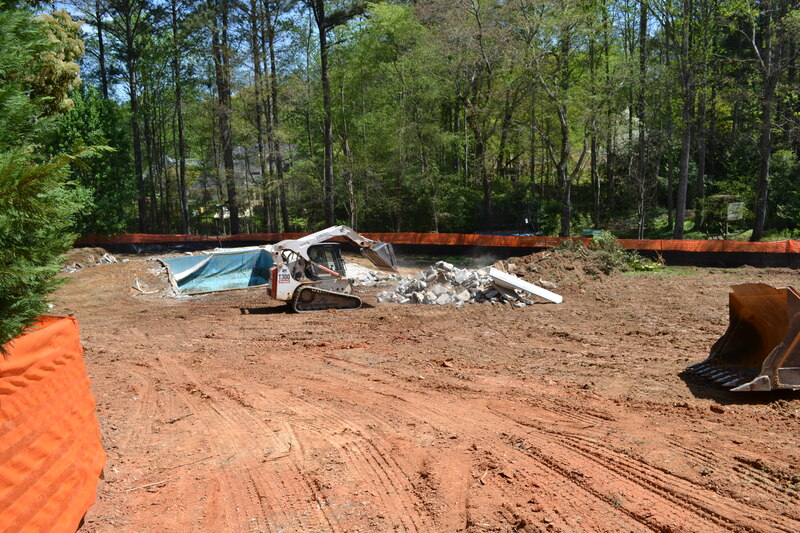 We demolished the original pool but we plan to have another pool but we likely will not start that until next spring. Let’s just get us in the house first! The “Porch” is the topic of the day. This is a typical day for me- The builder will text me and say, “Are you fine with the landscape plan?”. I have to get my phone out(because I am ALWAYS in the car) and pull up the latest PDF file and review it without crashing the car(don’t text and drive). Are you “okay” with _____ is a loaded question. You have to pay attention to the details because you are usually agreeing to a huge list of items that are not listed out. I open the plan and the one thing I see above all else is the location of the rear stairs to the backyard. They are now located at the far side of the back courtyard which seems like a huge distance to me to travel to access the backyard. We have ONE door from the main level to the back and that makes the stair location critical to me. It shows stairs in the center. That is where I thought they should go logically. For some reason, the new landscape plan has them on the left hand property line. I am not okay with that. So, after emails/phone calls and texts, we have to meet at the house tomorrow to discuss the stairs! Stairs. Just one piece of the puzzle but it has to hit right and you cannot make a corner piece out of an interior piece no matter how hard you force it into the puzzle. 3-26-2012 Today, they started grading work in the front and back. We are planning an addition that will go across the back of the home and a new single car garage will be added. We are also taking off the old front porch and replacing it with a larger front porch making the window above it smaller to accommodate the new. The plantings to the left of the home out front are gone as of tonight. The landscaping was so overgrown, it really dated the home. On the right side of the lot, there is a row of hydrangeas that are beautiful and those will not be touched. Also today, the right side of the home came off. That was a surprise to me- the roof was always coming off to accommodate Addison’s bath above the first floor but everything is gone so I guess that will be all new too! I know it seems like I should know this already but we are staying inside the walls over there so I really didn’t know it was totally coming down. This week brings lots of changes. Audrey got glasses. Bright pink ones which she will debut at school tomorrow. When I brought them home to her she put them on and said look at that apple over there and handed me HER glasses so I could clearly see the apple as she now does. So, I guess tomorrow brings a clearer day for Audrey. I went and looked at tile again today. So far, that is the most frustrating thing to conquer for me. There are just so many choices but I am just trying to find something neutral for the kids’ baths and the choices are limited with neutral and trying to keep cost reasonable. I have selected 12×24 tiles for the floors and 4×8 subway tile for the bath/shower walls. I did opt for a hexagonal marble tile insert on Addison’s bathroom floor to give her more grout in there and thus more traction which will help keep her from slipping. It’s very pretty and clean-looking. I just need to figure out if I want any accent bands or do anything interesting with the tile. I’m still working on the master bath. The only thing I know for sure is the glass mosaic shower tile. I am trying to find something that works with it and right now it may be marble. I wish I could get some glasses like Audrey and see things clearly tomorrow when I put them on. It would make the selections so much easier! So, I have learned that when you start focusing on the inside of the home, your finishes revolve around your kitchen counter selection. It defines the look, the colors and the feel of the home. It is that significant so due attention must be paid. I have been to so many stone lots- all the way up to South Carolina by car and even put in a call out of desperation to California and thought about having slabs shipped! Crazy. It shouldn’t be this hard but it is. I love the look of marble. I think a classic white kitchen is hard to beat. I like wood but I think paint is timeless whereas wood tones come and go so we will be going with a painted kitchen cabinet. On one of my first trips to look at stone, I came upon quartzite and once I saw it, that’s exactly what I wanted- quartzite is harder than granite and it does not etch or stain. 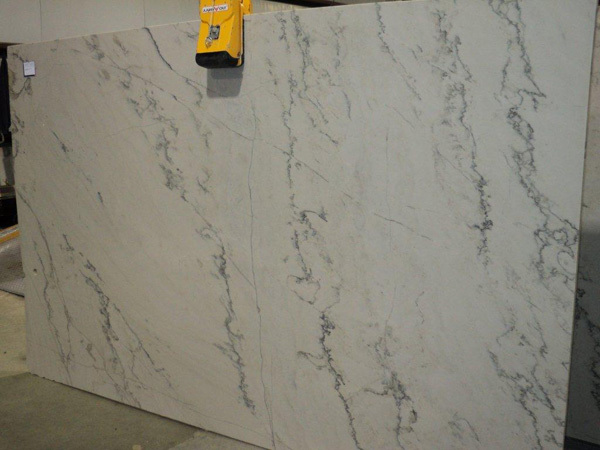 It looks like marble- it has the same veining without the specks that granite contains in the stone. It’s the best of both worlds- the ease of care like granite and the look of marble. It is more expensive that marble though- of course! I can pick them! I’ve been through a few different choices but the one that I think we are going with is called White Macabus. It is a taupey-grey color with a dark gray veining. I really like it. Some of the quartzites are whiter in color but they have a ton of straight lines that run straight across the slab and I just wasn’t so sure i wanted to start at those lines for the next 20 years. This one that I have picked is more random like marble. I think it will set the tone that we want for the house and I am loving the color grey right now and it works with that very well! Today, the siding came off the front and underneath was National Gypsum board that was basically sheetrock like you put on the inside of your house. So, that had to come off. Now, it is just wide open. It is shocking to look at. 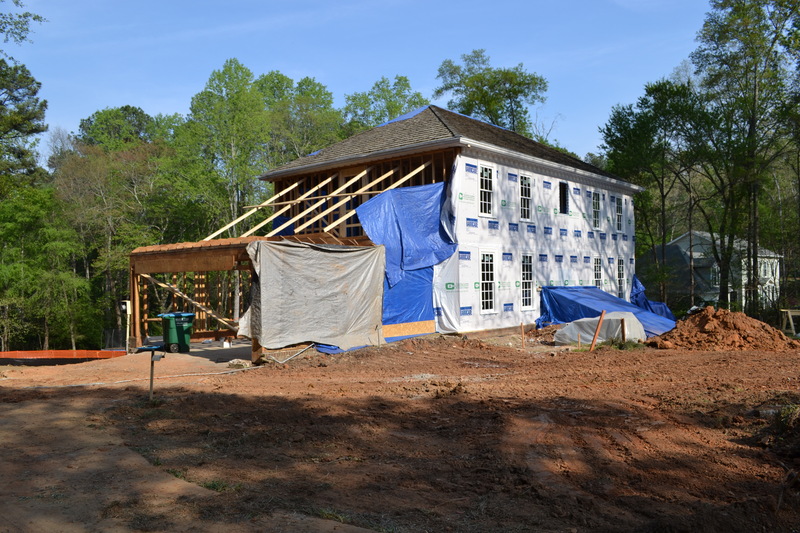 Tomorrow, the back of the house comes off and they may start moving dirt around for the footings for the back addition which will start to change the way things look a bit. That’s a good thing! They have actually almost finished reframing the entire upstairs minus the additions. We got to walk through the kids’ rooms, the bathrooms and closets. The new linen closet is there and the new upstairs laundry closet is framed. I am excited to have 2 laundry rooms! The new media room will be located over the garage on the left side and that isn’t built yet and a bathroom will be added over the right roof- also not there today. Upstairs, out the back, 2 baths will bump out the back wall so there are many spaces that are yet to come! Things look small when there is only framing to look at and you just see right through the “wall”. I keep going back to the plans and remeasuring. I started to panic walking through the new framing hoping everything would be right in the end. I just don’t want to screw it up and working with an existing space, you have to find a way to make it work and options are not unlimited. That’s both a blessing and a curse. My latest dilemma is trying to make Hudson’s “bunk beds” to work. They don’t even exist yet but I had that in my head that it is what we were doing in his room and I love the picture that I have. The problem is, it doesn’t work in the room that was supposed to be his room. So, I can flip-flop he and Addi’s room but that means the wall for her twin beds would be smaller if I switched them. Her beds are super cute and she has the flower chandeliers from PB Kids that go over her beds and I love them so it’s just comes does to how bad do I really want to have that bunk bed for Hud. Decisions, decisions. This week has been a week of discovery. First, once the foyer sheet rock was taken down and the front room walls were removed, termites had made their mark all over. There is no active infestation but they had more than a picnic at some point! The front door header, dining room header and many of the 2×4’s served as breakfast, lunch and dinner at some point. So, Breda Pest Management to the rescue- Dad went out and took a look and said no biggie. Just a couple of bad 2×4’s and the headers are already going anyways so no loss there(we are already paying for it in other words!). One of the previous owners decided not to use pressure treated wood in the basement so that will not work either. More to replace. This is the good and the bad of exposing everything. Sometimes ignorance is bliss but I am glad we know everything about the yellow house now- all her secrets and all of her faults. We can build her back stronger and better than new. The landscaper was there today too. Confirmed that the tree in front that has been there longer than the house needs to come down. It’s something we already knew but just another confirmation of something old that needs to go. It’s sad because it is one of those trees that is perfect for a wooden swing hanging from it. It frames the house. But the swarming termites that came out of it a year ago underscored the decay and rot that must be on the inside. Once it is gone, it will shed more light on the new home so I will choose to see it as a positive for now. More decisions regarding landscaping. We are going to fill in the old pool. It is a liner pool, you cannot redo a liner pool and it is just ugly. More than that, it doesn’t have a built-in cleaner and it is not attractive. It just won’t match the new house and while we can still get heavy machinery into the backyard, it will be less expensive to remove it now before the new garage goes up. More out with the old. 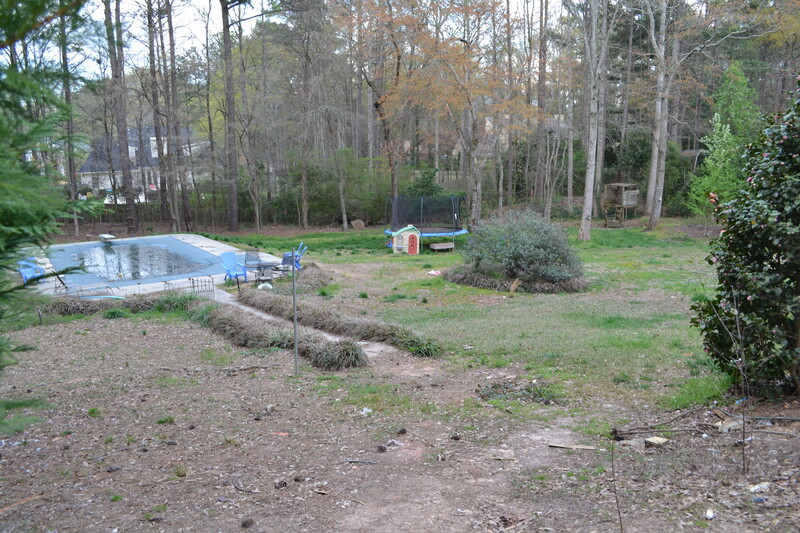 It gives us a chance to wipe the slate clean with the backyard and see what we can do with it. And the roof. We are raising the ceilings in the entire upstairs from 8′ to 9′. I think it will make a huge difference and obviously something we cannot do later. So, the entire inside of the roof is exposed with all the old ceiling removed. There are stains. The left side and the front of the roof are stained. All over. The roof is the one thing that made me okay with remodeling instead of leveling the house. It is a cedar shake roof. I love it. We do not have it in the budget to put a new roof on. So, the builder said he would have his roofer look at it and see what he thinks. We lived there for over a year and never saw evidence of a leak. So, it just has to be old. Perhaps the original builder put the felt on and took too long to put up the shake and it got wet. The builder said we would have to wait for a really hard rain and see if it is leaking. We all left and not 5 minutes after we left the house, the bottom fell out of the sky. it rained for an hour. Hard. After dinner, we headed back over to yellow house and no leaking. If it didn’t leak with that amount of rain, I am good with it as is. No new roof. I recently started using Pinterest to organize our selections. You can pick different pieces from different sites and be able to view them in one place. It is a great tool.